It’s been a really long time since we’ve been genuinely blown away by an audio system. It’s not as if we haven’t heard some fantastic sounding speakers and amps over the past few years — because we surely have. It’s just that we’ve come to expect a certain level of excellence from high-performance audio products — especially those that cost big bucks, take up a lot of space or involve lots of big components. 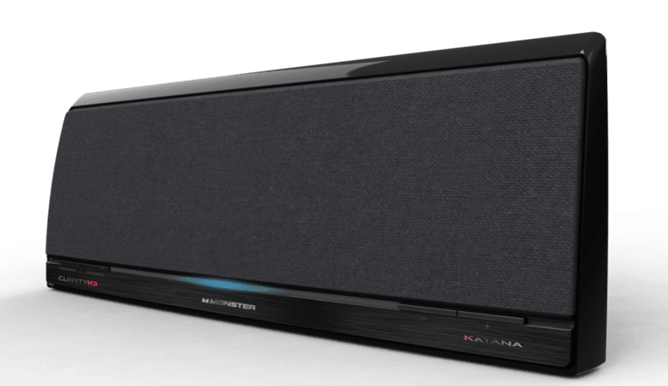 The Monster Katana is none of those things, yet, it is, without a doubt, the most impressive speaker system of its type that we’ve heard yet. Monster held a press preview event in New York today to show off its latest effort, but we weren’t there. That’s because we had a chance to listen to it weeks ago while visiting Monster’s headquarters in Brisbane, California. What we heard did, indeed, blow us away. We lunged for our laptop to share our experience with our readers, but the folks at Monster kindly asked that we keep our traps shut until the Katana could have its East coast coming out party. With that now out of the way, we can finally share the news. The Katana is not a portable speaker. It doesn’t have a rechargeable battery and you’re not going to be taking it to the beach. It is, however, a formidable single-cabinet, three-way, wireless speaker system comprised of six drivers (two tweeters, two midrange speakers and two woofers), a 400-watt amplifier, proprietary DSP and a port for Monster’s StreamCast HD system, which supports several audio codecs. The Katana’s magic does not boil down to some secret cocktail of Bluetooth wizardry. What makes this speaker sound so good is a combination of good ole-fashioned engineering, quality components and trial and error. Monster imbued the Katana with high-quality drivers, raw power, carefully-programmed DSP, a sealed cabinet, and, according to Monster product manager Mitch Witten, hours of voicing. This could have been done years ago — Audyssey got close with its South of Market and Audio Dock Air products — but Monster seems to have beaten everyone to the punch. Official pricing has not been disclosed, but Monster told us to expect the Katana to retail somewhere in the $600 to $700 range. Yes, that’s a lot. And normally we’d be taking this time to go on about all the different component systems that could be built for that kind of cash. But not even the Paradigm A2 active speakers we raved about can put out the sort of muscular, yet musical bass we heard from the Katana. (Though, admittedly, the A2 have some flexibility the Katana doesn’t match). It’s not just about bass, either. We heard the Katana reproduce sparkling, detailed high frequencies that never once overstepped their bounds, and midrange production that was lush and faithful to the recording. Lest you think that we auditioned the Katana in some carefully designed cocoon of aural nirvana with well-placed sound absorption panels and bass traps, we should tell you that the room we listened in was, from an acoustical standpoint, pretty stinking terrible. It was more like a sideways-trapezoid sonic nightmare. And, still, the Katana sounded fantastic.